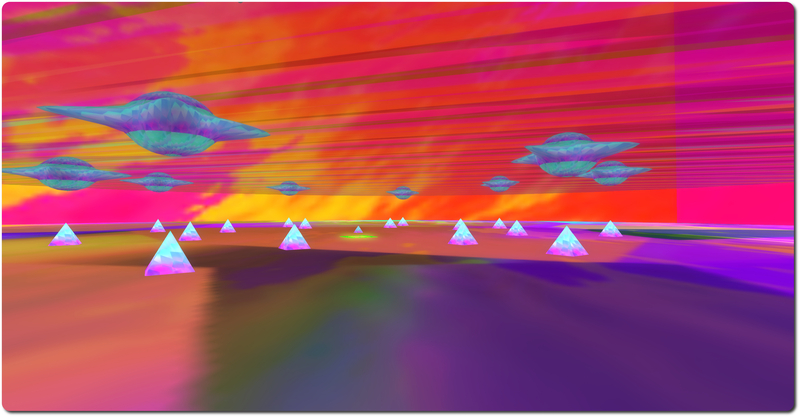 My Space, which officially opens on Friday August 29th at 13:00 SLT (with a concert by Ultraviolet Ultra from 14:00 SLT), is the latest installation by Betty Tureaud and a part of the AIR round 7 offerings. I had the opportunity to pay the installation a visit at the start of the week, and I have to say it’s …. interesting. There are of course Betty’s trademarked vivid colours throughout, and much of the piece is interactive; but quite what it is, is hard to define – other than having a strong element of fun about it and most likely being a place enjoyed when visiting with others. At the landing point, you’re furnished with a set of simple instructions: grab a rocket hat, ride the flying saucers (or use the teleport squares), rise up through the various levels of the installation and then grab a parachute (a Cubey Terra e-chute), and ride back down. The rocket hat isn’t actually vital to proceedings, although donning it will give you a foretaste of what is to come: touch it, and you’ll “launch” and start floating around and performing acrobatics against the bright background of your surroundings. 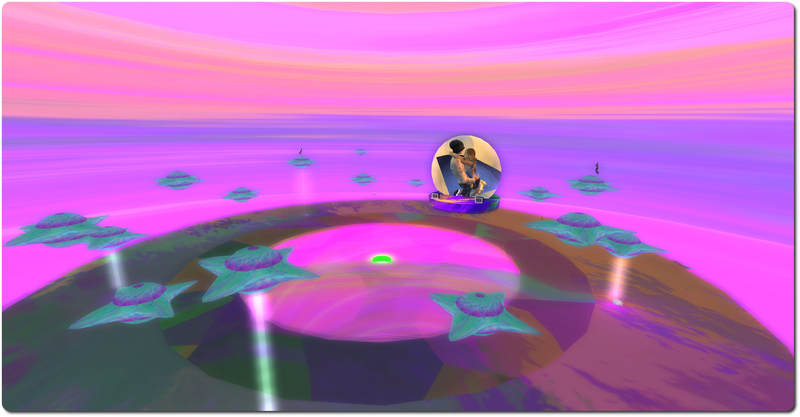 To get up higher, you can either attempt to sit on one of the aforementioned rising flying saucers, or touch the green squares and teleport up between the various levels. Riding the flying saucers will set you dancing, while using the teleport squares is probably the easiest way of getting between the levels. Most of the levels offer something to do, be it dancing, floating, swimming with jellyfish-like creatures, and so on, and each level also has a parachute dispenser for those wishing to get down to the landing point. Right at the top of the installation is what I believe to be the dance floor and stage for the opening concert, where one can dance on the floor area or up on one of the hovering flying saucers. The picture at the top of the piece shows the stage area, and hopefully also gives the scale of the place; you can just see two of us dancing on the saucers. To get down, one can either fly or use the aforementioned free parachutes. Simply wear one of the latter, step off a level and type “pull” in chat as you fall to open the ‘chute. Steering is best done in Mouselook when looking down (via the mouse) and using the cursor keys. Dropping down through the centre hole in the dance floor will take you through the middle of the various cones which form each of the levels, although careful steering is required, as you can “land” on the walls of the cone, re-packing your parachute in the process, something which will leave you falling. Should this happen, just type “pull” again to open the ‘chute once more. As noted at the start of this piece, defining My Space isn’t easy. 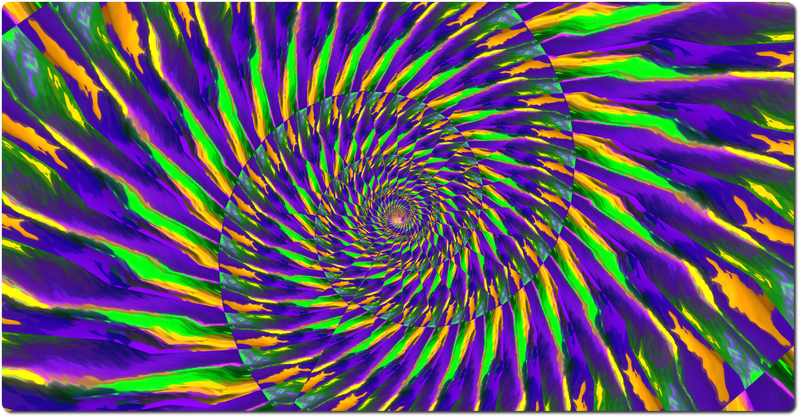 The colours certainly give it a psychedelic feel, and the flying saucers, floating jellyfish, dancing on a rotating, spinning gold disk in defiance of gravity, certainly add to the “trippy” feeling one gets. 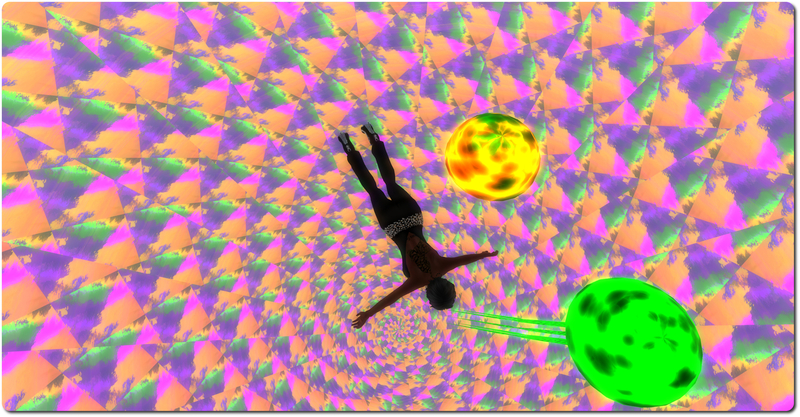 This feeling is perhaps further enhanced when parachuting through the centre of the cones on your way back down (particularly if you aren’t showing your avatar when in Mouselook and you’re not wearing any mesh), when the colours can become somewhat entrancing as they drift and spiral by. Overall, and as also noted, this is a piece that is perhaps best enjoyed with others. Betty has also indicated that she may well add to the piece throughout its run at LEA24, which will be until the conclusion of this round of AIR grants in December. Nikcy Perian has announced that Kokua is to fork development between Second Life and OpenSim. While both versions of the viewer will operate on either OpenSim or Second Life for the immediate future, due to an increasing numbers of issues the viewer has been experiencing in connecting to OpenSim-based grids as a result of recent SL-specific updates, the two will diverge over time, each focusing on fixes and updates specific to the gird type to which they are intended to connect. The release of Kokua.3.7.12 exposed some vulnerabilities of having one viewer handle both environments. The problem with Kokua-3.7.12 was that it could log on and perform well on some OpenSim grids but, would hang and then crash on others. Particularly troublesome was that it would crash on a standalone instance built from opensim git Master , OpenSim’s development track. Also, as reported by Inara Pey LindenLab is moving to content delivery network (CDN) for Meshes and Textures and plans drop UDP portocol once CDN is adopted. I suspect there will be a delay while the OpenSim core developers determine how best to approach those changes. 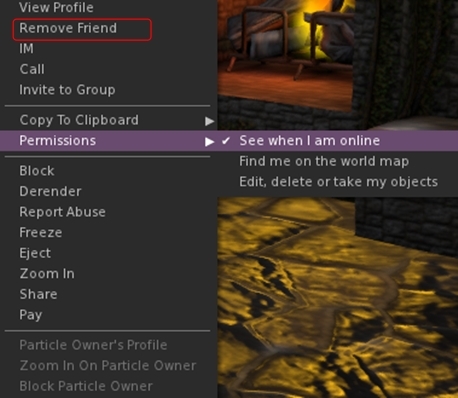 The comment relating to the Lab’s plans to introduce a CDN solution for texture and mesh fetching (and possibly more in the future), is interesting, as it also applies to those other TPVs which span both OpenSim and Second Life in terms of how they handle the changes as the progress (will they attempt to retain the UDP legacy code once the Lab start to remove it from their core code base? Will they also opt to fork?). As Nicky points out; there is also the question as to how the OpenSim core developers respond to the Lab’s move, and whether CDN capabilities will be added as an option for those grids as can afford it, or whether grids themselves might opt to add supporting code, depending on their needs and the perceived benefits. In the meantime, and alongside the announcement, Kokua have released version 3.7.8.35024 for OpenSim. The version number reflects the fact that the more recent code releases from the Lab (3.7.9 AIS v3 updates; 3.7.10 – SL Share 2; 3.7.11 – Snowstorm contributions: and 3.7.12 – Maintenance release quick fixes) have all been removed from the viewer, leaving it based on the 3.7.7 (interest list updates) and the 3.7.8 (Maintenance fixes) Linden code. To assist those using Kokua on both OpenSim and Second Life, the OpenSim version of Kokua will (under Windows) install separately to the SL version – I assume the same is possible with the Mac and Linux versions, allowing for the differences in how software is installed on those platforms. 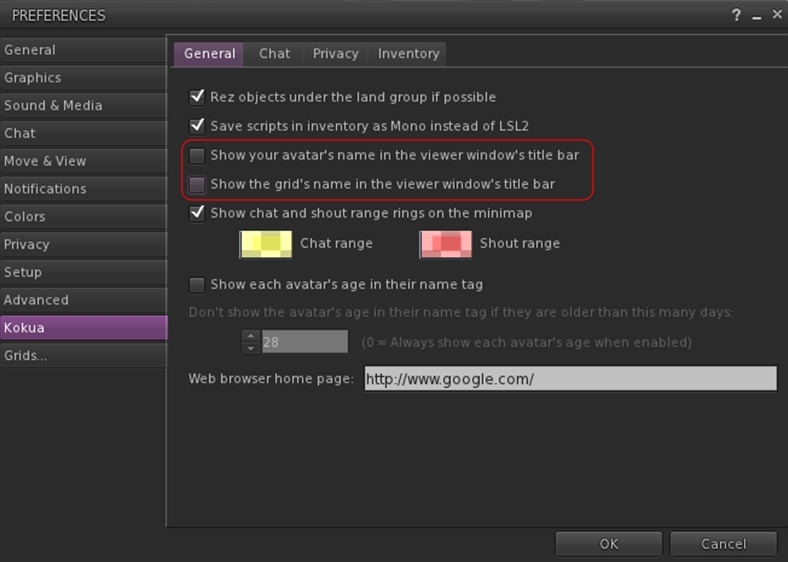 This means that once the differences between the two versions of Kokua become more apparent, users will be able to move between them when logging between SL and OpenSim with relative ease. Added localhost Win Grid Proxy 127.0.0.1:8080 and localhost Local Grid 127.0.0.1:8002 to the default drop down list; also added Tangle Grid to the default grid selection. Ported, with author permission, a change by Aleric Inglewood that prevents wearing of Inventory and Library root folders. Both the 3.7.8 and 3.7.12 versions of Kokua work well on Second Life; both had a test-drive while I took my PBY6A for another trip around Blake Sea – where I encountered not one, but two other Cats! Both viewers are also available for the Kokua wiki download page – just scroll down for the 3.7.8 version.